Today, President al-Bashir of Sudan has stepped down, following months of protests. Today, we witness the power of civil society to lead a non-violent movement creating real change. 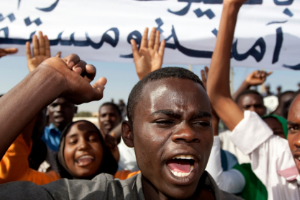 We spoke to our local peacebuilding partner, Rasha Ahmed of Collaborative for Peace Sudan (CfPS), about what the overthrow of Bashir might mean for prospects of peace in the country. Receive email alerts for latest blog posts, with stories of peacebuilding around the world and ideas of things you can do to make a difference in your life.